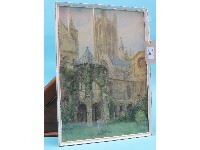 H. E. Tidmarsh - watercolour, entitled The Baptistry, Canterbury, a view of the Cathedral and foreground garden, signed, 15 x 11in. 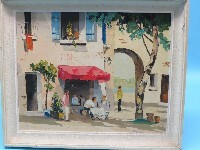 Caroline Burnett - oil on board, Paris street scene, signed, 12 x 16in. 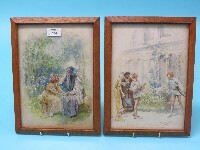 John H Bacon - pair of watercolours, scenes from Shakespeare, Twelfth Night and The Tempest, signed and dated '97, 11 x 8in. 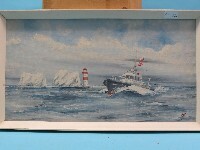 Will Longstaff - oil on canvas, portrait bust of a naval officer, 18 x 18in. 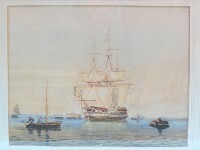 A 19th century watercolour - three-masted battleship and small boats on calm waters, unsigned, 13 x 16in. 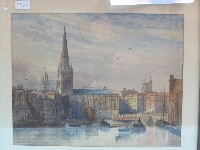 Ernest Parkman (1856-1921) - 19th century watercolour, named view of St. Nicholas Church, Bristol with foreground boating, signed and inscribed, 13 x 17in. 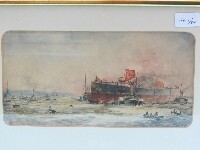 After William Lionel Wyllie (1851-1931) - watercolour dated 1890, The Birth of a Titan, battleship, a tug and smallboats approaching land, signed and dated, entitled pencil lower left, 6 x 12in. 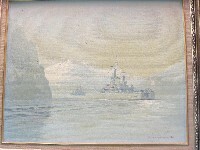 Rex Phillips (born 1931) - oil on board, "British Frigates in the Norwegian Leads", labelled verso, signed and dated '82, 16 x 20in. 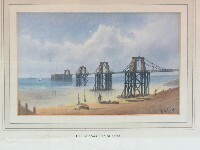 W. A. Earp (fl.1880-1900) - pair of watercolours, The Old Chain Pier, Brighton, and Old Brighton, signed, 5.5 x 9in. 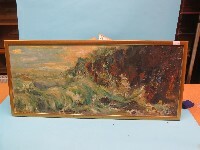 An abstract oil on board - rough seas at coastline, indistinctly signed lower right, 18 x 42in. 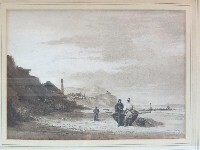 Thomas Lound (1802-61) - watercolour en grisaille, coastline fisherfolk, unsigned, 9 x 12.5in. 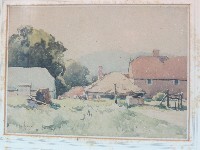 Edwin Harris - canvas laid on board, a wooded Sussex landscape, signed lower left, Aldridge Bros. Worthing label verso, 9.5 x 13.5in. 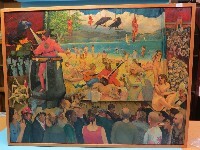 •Cyril Mount (1920-2013), large oil on hardboard, entitled label verso, Paradise Lost and Regained again in Cyberspace, complex alegorical composition, numerous dancing nudes and bearded guitarist, Miss Virtuality and foreground spectators, signed, 35 x 47in. 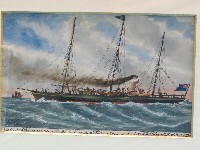 William Minshall Birchall (1884-1941) - watercolour, steam yacht on rough seas entitled Down Channel, signed and dated 1933, 5 x 7in. 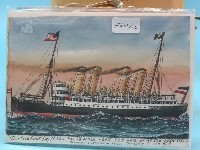 •J. 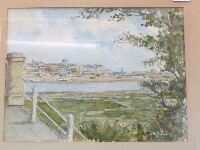 H. Powell - watercolour, a view of Shoreham Harbour, Sussex, indistinctly signed, 11 x 15in. 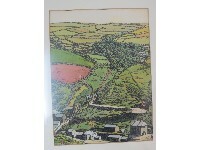 •J. 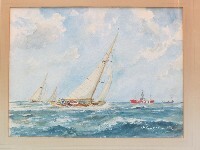 H. Powell - watercolour, racing yachts and middle-distant tankers, signed, 11 x 15in. 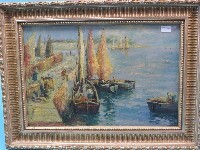 T. Williams - oil on canvas, impressionist-type harbour with arrival of fishing fleet, signed and dated 1927, 16 x 24in. 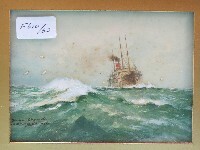 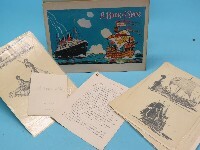 A. E. Pearson - marine oil on hardboard, inscribed verso 'Pilot Vessel "Link" at the Needles', monogrammed, signed, inscribed and dated verso 1970, 11 x 20in. 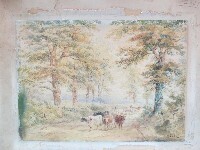 Henry Earp, senior (1831-1914) - watercolour, country pathway with cattle and drover, signed H. Earp snr, 10.5 x 15in. 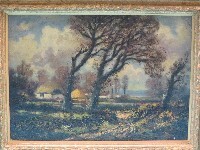 G. Crisp - Victorian oil on canvas, still life fruit, signed and dated 1888, 8 x 12in. 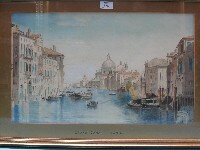 G. Leslie Baseley - watercolour, Grand Canal, Venice, 13 x 21in. 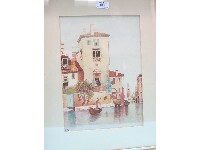 G. Leslie Baseley - watercolour, a Venice waterway, signed and dated 1908, 14 x 10in. 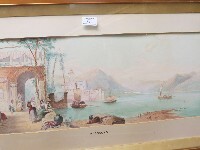 G. Leslie Baseley - watercolour, Maccagno, a view of the port and populated street, signed and dated 1907, 9.5 x 24in. 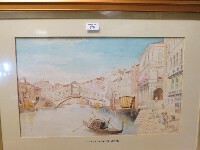 G. Leslie Baseley - watercolour, The Rialto Bridge, Venice, signed and dated 1907, 13 x 21in. 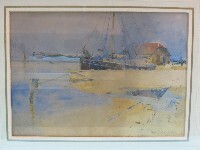 Duran Faine - modern oil on canvas, panoramic riverscape, signed, 24 x 36in. 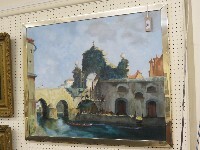 WITHDRAWN - An oil on canvas - Venetian canal with workmen, unsigned, 24 x 30in. 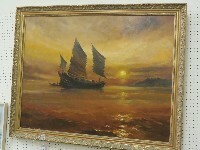 Dion Pears - oil on canvas, Chinese sailing vessel, signed, 28 x 36in. 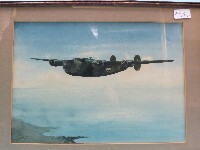 Ida Simpson - oil on panel, mother and child, 28 x 23in. 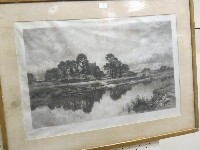 WITHDRAWN B. W. Leader - monochrome etching, riverside view with barge and middle-distant church, signed in pencil on mount, 18 x 28in.